Now that you’ve got the basic chart patterns down, it’s time to move on and add some more advanced tools to your forex trading arsenal. 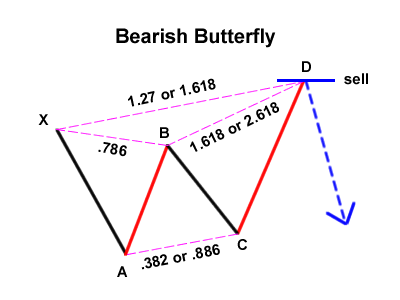 In this lesson, we’ll be looking at harmonic price patterns. These bad boys may be a little harder to grasp but once you spot these setups, it can lead to some very nice profits! The whole idea of these patterns is that they help people spot possible retracements of recent trends. In fact, we’ll make use of other tools we’ve already covered – the Fibonacci retracement and extensions! Phew! That’s quite a lot to cover! But don’t you worry… Once you get the hang of things, it’ll be as easy as 1-2-3! We’ll start off with the more basic ABCD and three-drive patterns before moving on to Gartley and the animals. After learning about them, we’ll take a look at the tools you need in order to trade these patterns successfully in the forex market. For all these harmonic price patterns, the point is to wait for the entire pattern to complete before taking any short or long trades. We’ll just pop in another letter at the end (because we’re cool like that), and we’ve got the ABCD chart pattern! That was easy! To spot this chart pattern, all you need are ultra-sharp hawk eyes and the handy-dandy Fibonacci chart tool. 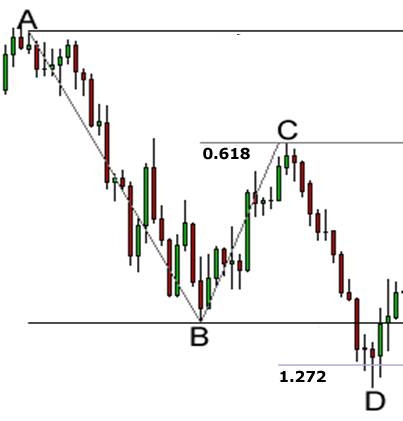 If you use the Fibonacci retracement tool on leg AB, the retracement BC should reach until the 0.618 level. Next, the line CD should be the 1.272 Fibonacci extension of BC. Simple, right? All you have to do is wait for the entire pattern to complete (reach point D) before taking any short or long positions. Then, drive 2 should be the 1.272 extension of correction A and drive 3 should be the 1.272 extension of correction B. By the time the whole three-drive pattern is complete, that’s when you can pull the trigger on your long or short trade. Once upon a time, there was this insanely smart trader dude named Harold McKinley Gartley. He had a stock market advisory service in the mid-1930s with a huge following. This service was one of the first to apply scientific and statistical methods to analyze the stock market behavior. 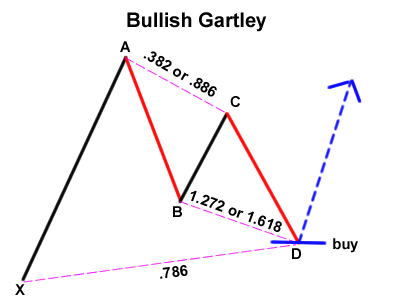 According to Gartley, he was finally able to solve two of the biggest problems of traders: what and when to buy. Soon enough, traders realized that these patterns could also be applied to other markets. 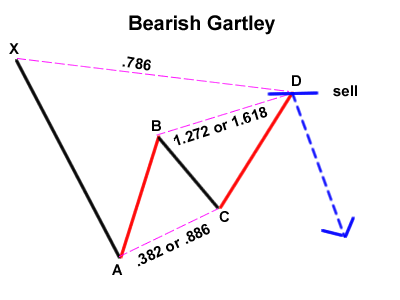 Since then, various books, trading software, and other patterns (discussed below) have been made based on the Gartleys. 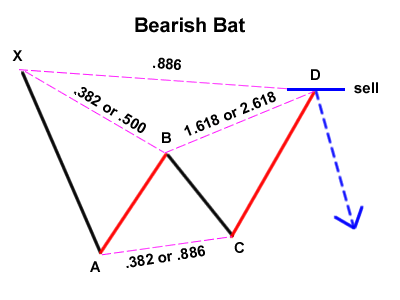 The Gartley “222” pattern is named for the page number it is found on in H.M. Gartleys book, Profits in the Stock Market. 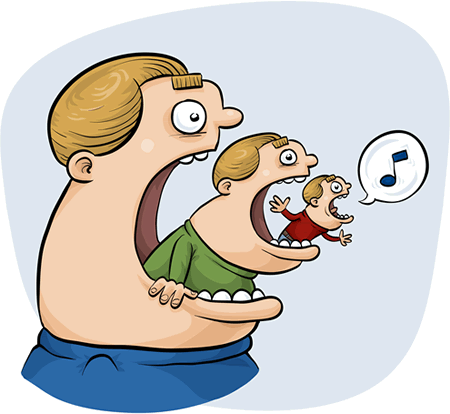 Gartleys are patterns that include the basic ABCD pattern we’ve already talked about, but are preceded by a significant high or low. Now, these patterns normally form when a correction of the overall trend is taking place and look like ‘M’ (or ‘W’ for bearish patterns). 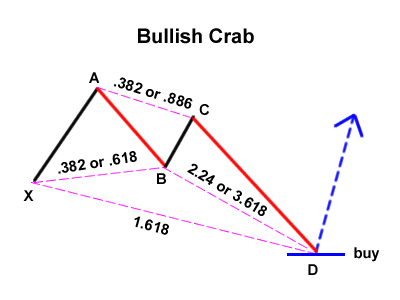 These patterns are used to help traders find good entry points to jump in on the overall trend. A Gartley forms when the price action has been going on a recent uptrend (or downtrend) but has started to show signs of a correction. What makes the Gartley such a nice setup when it forms is the reversal points are a Fibonacci retracement and Fibonacci extension level. This gives a stronger indication that the pair may actually reverse. This pattern can be hard to spot and once you do, it can get confusing when you pop up all those Fibonacci tools. The key to avoiding all the confusion is to take things one step at a time. 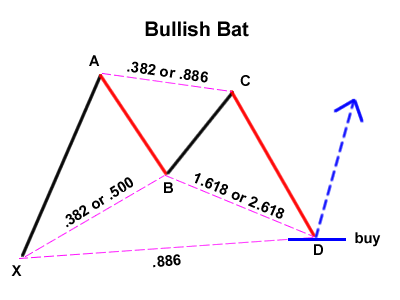 In any case, the pattern contains a bullish or bearish ABCD pattern, but is preceded by a point (X) that is beyond point D.
Move BC should be either .382 or .886 retracement of move AB. If the retracement of move BC is .382 of move AB, then CD should be 1.272 of move BC. Consquently, if move BC is .886 of move AB, then CD should extend 1.618 of move BC. As time went by, the popularity of the Gartley pattern grew and people eventually came up with their own variations. 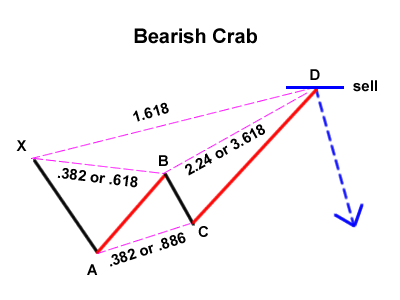 In 2000, Scott Carney, a firm believer in harmonic price patterns, discovered the “Crab“. According to him, this is the most accurate among all the harmonic patterns because of how extreme the Potential Reversal Zone (sometimes called “price better reverse or imma gonna lose my shirt” point) from move XA. If the retracement of move BC is .382 of move AB, then CD should be 2.24 of move BC. Consquently, if move BC is .886 of move AB, then CD should be 3.618 extension of move BC. If the retracement of move BC is .382 of move AB, then CD should be 1.618 extension of move BC. Consquently, if move BC is .886 of move AB, then CD should be 2.618 extension of move BC. CD should be .886 retracement of move XA. 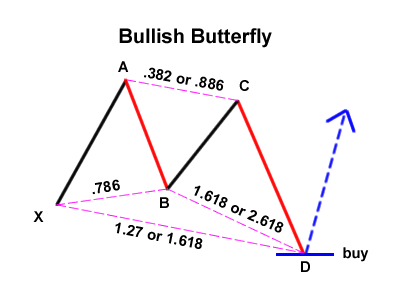 Then, there is the Butterfly pattern. Like Muhammad Ali, if you spot this setup, you’ll surely be swinging for some knockout-sized pips! As you may have guessed, profiting off Harmonic Price Patterns is all about being able to spot those “perfect” patterns and buying or selling on their completion. By following these three basic steps, you can find high probability setups that will help you grab those oh-so-lovely pips. Let’s see this process in action! Oh wow, that looks like a potential Harmonic Price Pattern! At this point in time, we’re not exactly sure what kind of pattern that is. Heck, it could even be a Moose! In any case, let’s label those reversal points. Using the Fibonacci tool, a pen, and a piece of paper, let’s list down our observations. Move BC is .618 retracement of move AB. Move CD is 1.272 extension of move BC. The length of AB is roughly equal to the length of CD. 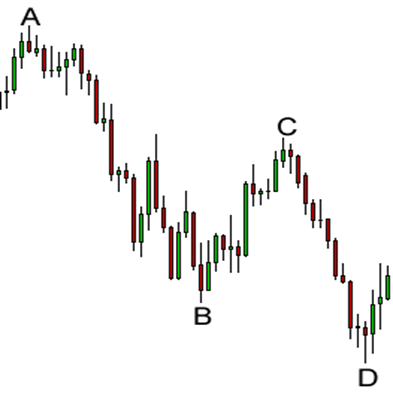 This pattern qualifies for a bullish ABCD pattern, which is a strong buy signal. 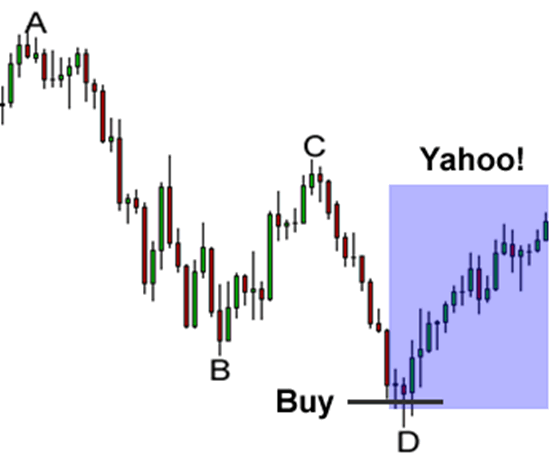 Once the pattern is complete, all you have to do is respond appropriately with a buy or sell order. In this case, you should buy at point D, which is the 1.272 Fibonacci extension of move CB, and put your stop loss a couple of pips below your entry price. The problem with harmonic price patterns is that they are so perfect that they are so difficult to spot, kind of like a diamond in the rough. Spot on with this write-up, I seriously think this site needs a great deal more attention. I’ll probably be returning to read more, thanks for the advice! Thank you for another informative blog. Where else could I get that type of information written in such an ideal approach? It’s an remarkable paragraph in favor of all the web viewers; they will obtain benefit from it I am sure. You probably don’t even know where to start. he found out the important recommendations shared on the site. Browsing your blog article is a real wonderful experience. Função da SaúdeSociedade Brasileira a Nefrologia. able to actually obtain useful facts regarding my study and knowledge. but I had to ask. Does operating a well-established blog such as yours take a lot of work? this topic for ages and yours is the best I’ve came upon till now. swap techniques with others, please shoot me an e-mail if interested. publish was good. I do not recognise who you might be however certainly you are going to a well-known blogger when you are not already. Thank YOU for the meal!! But yeah, thanx for spending some time to talk about this matter here on your web site. What’s up friends, fastidious article and fastidious urging commented here, I am really enjoying by these. I’ve a project that I’m simply now running on, and I have been on the look out for such info. upon your website and in accession capital to assert that I acquire in fact loved account your blog posts. Because the admin of this site is working, no hesitation very shortly it will be renowned, due to its feature contents. Good replies in return of this question with firm arguments and explaining all on the topic of that. What’s up mates, nice piece of writing and nice urging commented at this place, I am really enjoying by these. like this before. So nice to find another person with original thoughts on this issue. Thank you for every other informative blog. The place else may just I get that type of information written in such a perfect method? Thanks a lott foor sharing this with all of uus you actually understand what you’re talking approximately! that I actually loved the standard info an individual provide in your guests? Howdy, I think your site might be having internet browser compatibility issues. a villa for rental by city, a range of rooms lofts and villas. within the field, bachelorette party? Play with a pal who leaves Israel? recreation suitable for any age. The website is also the centre of rooms through the hour, which is already another subject, for lovers who want a deluxe room equipped for discreet entertainment having a spouse or lover. Moreover, The contents are masterwork. you’ve performed a wonderful task on this matter! Your web site offered us with valuable information to work on. You’ve done a formidable job and our whole community will be thankful to you. I became honored to get a call from a friend as soon as he found the important recommendations shared on the site. Going through your blog posting is a real excellent experience. acquainted of this your broadcast provided brilliant transparent idea.